Apart from the terrestrial pulmonate snails (Stylommatophora), constituting the large majority of terrestrial gastropods, there are several groups of terrestrial snails evolved from water-living groups in different ways. In Europe, those are the round mouthed snails (Pomatiidae), the Cochlostomas (Cochlostomatidae) and the needle snails (Aciculidae). The thorn snails (Carychiidae) could be counted among them, as those are most closely related to coast snails, such as the mouse-ear snail (Myosotella myosotis). 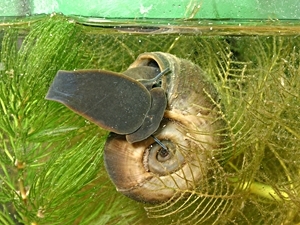 Ram's horn snail (Planorbarius corneus) - a freshwater snail. There are, though, other snail groups resembling water snails externally, but no more closely related to them, except for both being gastropods. Among those there is the Quimper snail (Elona quimperiana), a snail species named for the city of Quimper in Brittany, which also only lives there, and in North Spain and North Portugal. On the first glance, the Quimper snail strongly resembles a ram's horn snail (Planorbarius corneus). But, looking more closely, one observes that Quimper snails are basically ordinary terrestrial pulmonate snails with two pairs of tentacles and eyes at the end of the larger pair. Hartmut Nordsieck: "Higher classification of Helicoidea (Gastropoda: Stylommatophora) and the molecular analyses of their phylogeny", Part 1: Classification. (Accessed 03.12.2010). Source: Wikipedia: Escargot de Quimper. Description: The Quimper snail has a translucent shell with a greenish brown shell skin (periostracum, see: The Snail Shell, Part 1). The shell surface is striated and may show some transversal irregularities because of growth pauses. Juveniles have shell with short hair. The apertural whorl outweighs all other whorls considerably. The shell's upper side is flat and depressed. The apertural rim is slightly folded back and displays a whitish lip on the inner side. The shell navel (umbilicus) is open and deep, it takes about one seventh of the overall shell diameter. The snail itself is greyish, the lower part of the foot is coloured a bit more lightly. The mantle shows irregular dark spots which can be seen through the shell wall. Dimensions: H: 10 - 14 mm; W: 20 - 30 mm. (Abbreviations). 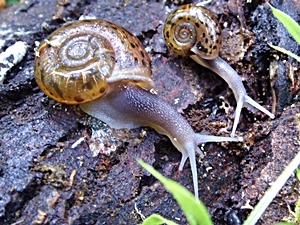 Habitat and Distribution: The Quimper snail inhabits humid and shady places in forests and bushes with herb vegetation, often also near cave entrances and on wet rocks. The species' distribution area covers parts of north-western France, northern Spain and northern Portugal. In Spain, Quimper snails have been found in altitudes of up to 1000 m MSL. 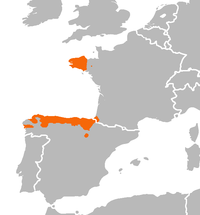 The Quimper snail's distribution area is no continuous - the area in Brittany is separated spatially from the areas in Spain and Portugal. Such a distribution area is called disjunct. Francisco Welter-Schultes: Elona quimperiana species homepage. Wikipedia: Escargot de Quimper (Elona quimperiana). Kittel, K. (2002): Bemerkenswerte, ungewöhnliche und wenig bekannte Mollusken, VI. Das Landposthorn Elona quimperiana (Blainville 1821) mit einem Nachweis für Portugal (Pulmonata, Elonidae). Club Conchylia Informationen, 34 (1 - 3): 19 - 21.